In 1991, the American Institute of Wine and Food, a national organization founded by Julia Child and Robert Mondavi, divided its small rare book collection between Radcliffe College and the University of California, San Diego. These books had originally come to AIWF from two private libraries, those of connoisseur and historian Andre Simon and bibliophile Eleanor Lowenstein. The initial gift to UC San Diego from AIWF numbered 364 volumes. UC San Diego’s AIWF Collection now includes more than 7,200 volumes and is housed in Special Collections & Archives. While the initial gift books from AIWF were largely devoted to descriptions of European cuisine and culinary history from the seventeenth to early nineteenth centuries, collecting efforts of recent decades have focused on Asia, Mexico and Latin America, California and the American West, and the nations of the Pacific Rim–all areas of strong academic interest at UC San Diego. In addition to culinary history, the collection supports research and instruction in cultural studies, social history, women’s studies, anthropology, nutrition, and medicine. The AIWF Culinary Collection includes such rarities as Bartolomeo Scappi’s Opera... dell’ arte del cucinare (1610), with its beautiful woodcuts of the Renaissance kitchen and culinary implements; Amelia Simmons’s American Cookery (1814), the first truly American cookbook; Robert Roberts’s A House Servant’s Directory (1828), the first household manual/cookbook written by an African-American; How We Cook in Los Angeles (1894), with more than 600 recipes from more than 200 named Angelenos; and Acerca del chocolate (1730), a manuscript from Mexico that is an attempt to rebut the Church’s strictures against the consumption of chocolate. More contemporary works that help document the culinary history of today may also be found in the collection, e.g., Piret’s: The George and Piret Munger Cookbook (1985), six cookbooks from Alice Waters’s famed Chez Panisse restaurant, and Thomas Keller’s The French Laundry Cookbook. 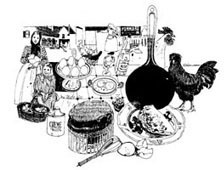 The AIWF Culinary Collection is fully cataloged; records may be consulted online through ROGER WEB and MELVYL, the UC San Diego Library and UC-wide online catalogs. Additionally, a search in ROGER on the title “American Institute of Wine and Food Culinary Collection” will bring up the entire culinary collection for browsing or searching.